It’s fair to say the play-offs have not been spoken about too much in the confines of the Cobblers changing rooms this season. 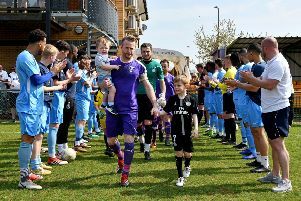 Last summer there was certainly talk of promotion, but the realities of life back in Sky Bet League Two soon ensured the the main focus for the Town players has been keeping their heads above the relegation places. Following the 4-0 hiding at the hands of Colchester United on February 2, the Cobblers fans were still fearing the worst. But a run of five wins and three draws has seen the Cobblers charge up the table to 11th, and with eight games of the season remaining, they are very much in the hunt for a place in the top seven. The six-point gap will still take some closing, but attacker Sam Hoskins admits the players are now starting to believe they can do something special. “You always look as far up the table as you can,” said Hoskins. “A month ago it was a bit far fetched, but now we have put this run together and if we had won on Saturday (Town drew 0-0 at Grimsby) then we would certainly be looking in a really good position. “But we are still only six points off it, and we just have to go into every game now believing we can win it. So, are the players discussing the play-offs? “We have just started to talk about it, but I don’t want to too much to be honest,” said the 25-year-old. “I don’t want to sort of get too excited and for it then not to happen, but it is becoming more realistic now. The Cobblers return to action on Saturday with another road trip, this time to a Cheltenham Town side that triumphed 3-1 at the PTS Academy Stadium back in September. “It will be another tough game, but we are confident we can go to any place and get the three points,” said Hoskins. “We were disappointed on Saturday not to come away with the win, but it is credit to what we have been doing that we were disappointed with that. “Cheltenham is another great opportunity to get the three points. “We just need to continue doing what we are doing, and we can’t really focus too much on the opposition. “We want to go there and play the way we want to play, and dominate teams like we have been doing in the past few weeks.